Maybe you're hanging on to an older iOS device or maybe you just got a great secondhand bargain. 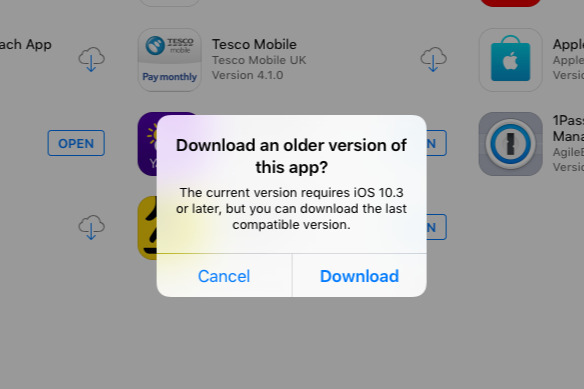 Either way, you can't update the device to the latest iOS and so you also can't download the latest versions of your apps. Since the App Store only ever shows you the latest versions, it looks as if you're stuck unable to get your old apps back. Yet you can do it, and you can do it easily -- if you know where to look. 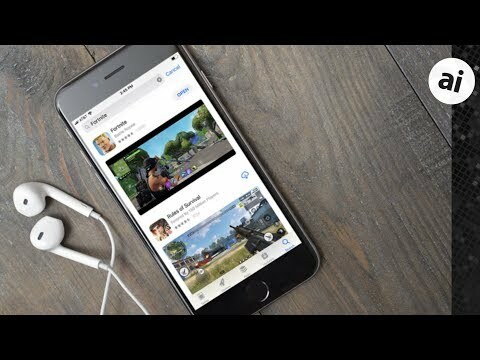 Watch an AppleInsider two-minute tip video on this or read on for extra detail. Open the App Store on this older device of yours and then tap on the Purchased button. As great as older iOS devices are, they are older and they are usually slower so this won't be quick. Especially not as you need to wait until the complete list of your previously purchased apps is displayed. Once the list is complete -- and all the icons have displayed too -- search for the app you want. It will be there with an iCloud download icon next to it. Just tap on that iCloud download icon and you're done -- or very nearly. The trick here is to wait. And maybe wait for a considerable time, too. Don't tap away, don't leave the App Store, just wait. 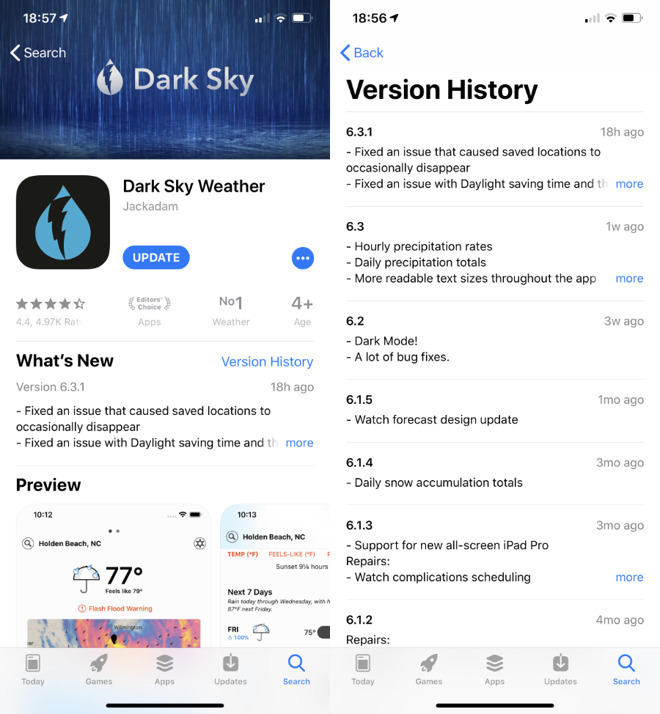 After some amount of time, the App Store will display a notification saying that no, you can't have this app because it doesn't work with the version of iOS that your device has. However, it will also offer to let you download a previous version. This is a really smart feature from Apple because it offers you this compatible version but it also makes sure that you're getting the newest that you can. If an app has been updated five times a year, you'd struggle to know which was the very latest you could use but Apple knows and Apple tells you. Simply tap the Download button and soon that app will be on your older device. Apps get updated for a reason. You're not going to have the same experience with an older version of an app on an older device than you will with a newer setup. Speaking of newer setups, though, it looks as if you can only use this download trick with apps that you have previously bought. If this older device is your sole iOS one then that's true, but if you have a newer one as well, you can do something more. On the newer iOS device, find and buy an app you want -- that you know has a previous version which will work on your older machine. That's the hard part. There's no surefire way of knowing for certain and the best you can do is take an educated guess. If you can find references online to the app being updated around the date of your older device, you're probably in luck. Buy it on the newer device and then it's in your Purchased history on all your iOS devices. And that means also on your older one. Give it a few minutes for the information to propagate through the App Store but thereafter you should be able to do this download trick and get the previous version that works with your older device. If for some reason there wasn't a version that ever worked on your older device then there's nothing you can do. However, you've at least got that app on your new iOS device and can use it there. Sadly some vendors CHOOSE to remove older versions of their apps. I have some one the LBC radio app which still works on a device that has it installed but which isn’t available for download anymore and so I cannot get it onto another devise I reset. Another anoting app CW tv when I start it the irritating app forces me over to the App Store to update it and then the App Store says the new app doesn’t support my device. This forced update basically brakes the app willing would probably otherwise work. This is made worse by the cw web site which sees I’m on an iPad and so refuses to stream video using web insists install an app. I recently had to wipe and then update a late 2008 MBP 15", which took me to MacOS High Sierra. Unfortunately Apple does not provide a way to update iWork even when I re-installed it from my original disks. It kept giving me an error to update and then hanging in the current Mac App store, such as you described. There is a way to update the older iWorks via update 9.3 which was released on 2012 (Apple's latest support note is dated Dec 19, 2016). This will bring iWork Pages up to v4.3, Numbers 2.3 and Keynote 5.3. That is as far as I could get, but these versions are stable and can open older windows format documents. Running this also stopped the repeated requests to update. “As great as older iOS devices are, they are older and they are usually slower so this won't be quick.“ !!! No, no, no. On the contrary and very often, older iOS versions running older versions of apps are faster than running on newer iOS version. Older versions of apps were “optimised” for older iOS versions. That’s why I’m still using iPad 2, side by side my iPad 2017! Read it again. This isn't talking about old operating systems, this is talking about the older hardware accessing the newer, and more resource-heavy app store. The iPad 2 is most definitely not faster than a 2017 one. I have one and its as slow as molasses. Doesn't work with Skype on first gen of iPad. I think Apple was previously overly optimistic about backward compatibility of older devices with newer iOS versions. I have an original iPad Mini, iPad 2, and iPhone 4s. The newest version of iOS that Apple supports on these devices is barely usable. The version of Safari on these old devices does not support content blocking and Safari simply can’t keep up with the avalanche of ads that litter modern web sites. My expectation is that these old devices should at least function as well as they did when they were new with apps of the same era. However the last iOS version that installs on these devices seems to have surpassed the device’s capabilities and rendered the devices barely usable. Nobody likes to see their devices no longer supported when a new version of iOS rolls out, but when Apple allows a newer version of iOS to be installed on a device and the device functionality suffers you can be stuck with a dud of a device with no way to roll it back to a usable version of iOS. Yes, but only up to a point. And it usually requires you to not be running the most recent compatible version of iOS. My iPad 2, for example, ran apps much faster on iOS 6 than iOS 7. And some apps broke altogether. Upgrading to 7 was a big mistake, but once done there was no way to go back.